Light detection and ranging (LiDAR) image of the southeast wall and currently active pit crater of Halema`uma`u. Image courtesy of Todd Erickson, Pacific GPS Facility SOEST University of Hawaii, Manoa. This month, researchers from the University of Hawai`i teamed up with the Hawaiian Volcano Observatory staff to use laser-based technology to peer into the depths of a new pit in Halema`uma`u. What they saw was startling. The look revealed that the vent has a cavernous interior that dwarfs the size of the opening that we see at the surface. The cavern is approximately 200 m (650 ft) below the floor of Halema`uma`u, making it a dizzying 285 m (935 ft) below the now-closed Halema`uma`u overlook area. To obtain the image, the UH researchers were using a technology called Light Detection and Ranging, or LiDAR, for short. By bouncing pulses of lasers off objects, LiDAR can determine the distance to out-of-reach objects. Readers may be familiar with similar technology used in the laser range finders employed by golfers, hunters, and builders. Simple laser range finders measure a single distance to an object. In contrast, scientist using LiDAR data can produce entire images, or models, of distant surfaces based on thousands of individual laser bounces. The remarkable part of the image is that it reveals a very deep pit crater with dramatic overhanging walls near the surface. This is different from the steep and vertical walls of the larger Halema`uma`u and Kilauea caldera. 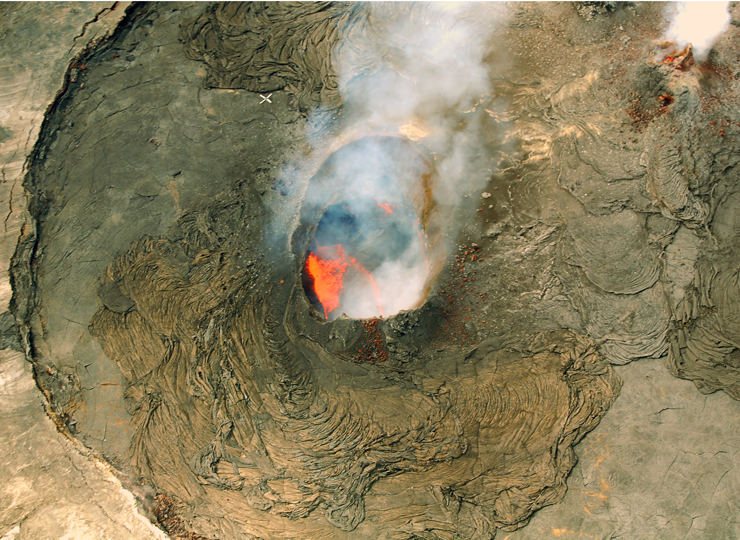 What the image actually reveals is a snapshot in the evolution of a Hawaiian pit crater. “Pit crater” is a general term used to describe the steep-sided, semi-circular, and flat-bottomed craters that are characteristic of the summit and rift zone areas of Kilauea and Mauna Loa volcanoes. Interchangeable terms for these features include, “collapse crater”, and of course the eloquent Hawaiian name for a pit, “lua”. But how are these craters created? 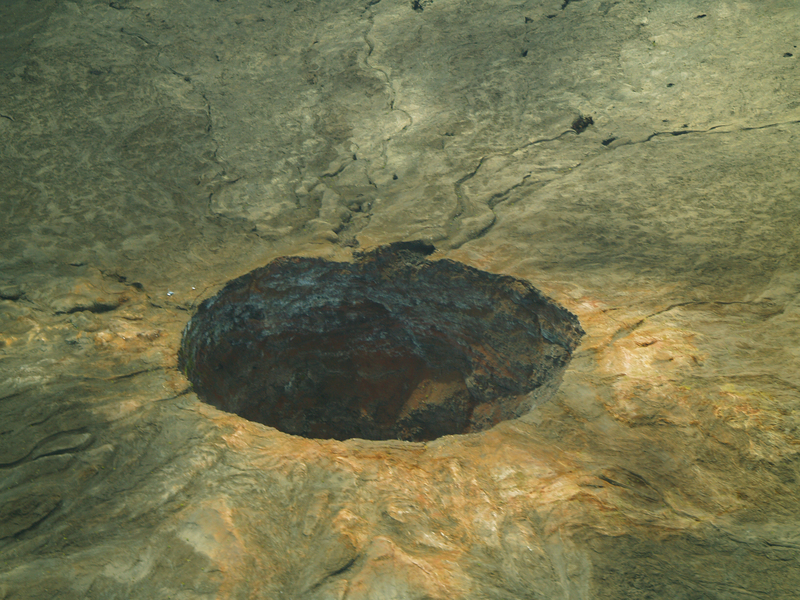 Looking into this deep hole created by a volcano may lead one to think that all the material was blasted out. But if this were the case, we would be able to see a vast amount of excavated material deposited around the rim of the pit. In fact, the amount of ejected material, or ejecta, surrounding Hawaiian pit craters is relatively small — far less than the amount of material required to fill the hole back up. And, some Hawaiian pit craters do not have any ejecta surrounding them. The answer to how pit craters form is being witnessed right now as the new vent evolves. Hawaiian pit craters form primarily through the evacuation, or loss, of magma somewhere beneath the vent. As magma evacuates from the plumbing system below, the conduits collapse and the vent floor sinks away. The walls may become overhung, since the interior of the pit expands as it drops. Eventually, the overhung portions of the rim collapse into the pit, and the characteristic near-vertical sides of the pit crater are formed. Our observations of lava within the vent, data from instrumentation, and measurements of magma flux at the east rift zone near Kalapana, suggest that the amount of magma within the plumbing system of Kilauea has been reduced. This ebbing has caused the drop in the lava level and the growth of the cavern we now see. The recent pulses of ash-laden plumes issuing from Halema`uma`u have been caused by collapses of the pit’s overhanging rim. Of course, the drop in the vent floor, and ebb in the flow of magma within the system, does not necessarily mean the eruption is winding down. A characteristic behavior of Hawaiian pit craters is that the floor may refill with a lava lake, only to drain and collapse again and again. So the laser’s look into the lua is certainly only a snapshot of the on-going evolution of Halema`uma`u. Surface flows have been active on the pali within Royal Gardens subdivision throughout the past week, burning forest and one unoccupied structure. At the coast, the Waikupanaha and Kupapa`u ocean entries remain active and continue to produce steam plumes and small littoral explosions. The vent at Kīlauea’s summit was dark and quiet all week, producing only a very small quantity of rock dust from small collapses of the vent walls. The plume has been thin and wispy, and volcanic gas emissions have been relatively low. They are, however, still elevated above background levels, resulting in high concentrations of sulfur dioxide downwind. One earthquake beneath Hawai`i Island was reported felt this past week. A magnitude-2.8 earthquake occurred at 10:38 p.m., H.s.t. on Thursday, July 9, 2009, and was located 3 km (2 miles) south of Holualoa at a depth of 36 km (22 miles). Visit our Web site (http://hvo.wr.usgs.gov) for detailed Kīlauea and Mauna Loa activity updates, recent volcano photos, recent earthquakes, and more; call (808) 967-8862 for a Kīlauea activity summary; email questions to askHVO@usgs.gov. 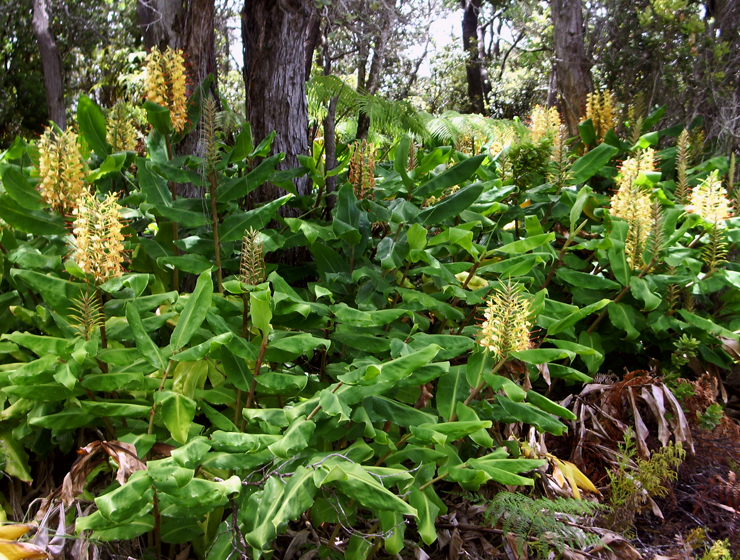 For more information on visiting Hawaii in general and touring Hawaii Volcanoes National Park in particular, please also visit www.tourguidehawaii.blogspot.com and www.tourguidehawaii.com. 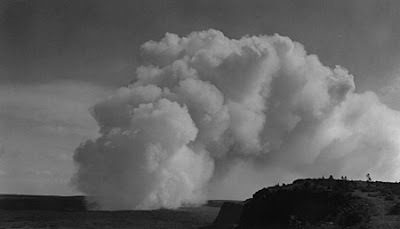 A single low lava fountain emitted a steady stream of gas when photographed by Fred Rackle on July 21, 1952, when Halema`uma`u Crater was more than twice as deep as it is at present. View is to the southwest. The HVO Web site was recently revamped to make access to our increasing number of Webcams easier for About 20 minutes before midnight on June 27, 1952, almost exactly 57 years ago, Mrs. John Fox walked from the living room of her home on the east rim of Kilauea caldera into an adjoining room. She was instantly startled by a loud, whistling roar coming through an open window. Running back into her living room, she saw a bright orange glow lighting the night sky. At about the same time, just down the road at Kilauea Military Camp (KMC), Colonel B.W. Rushton pointed out the bright glow to Hawaiian Volcano Observatory (HVO) staff member John Forbes, who quickly called Gordon Macdonald, then Scientist-in-Charge of HVO. 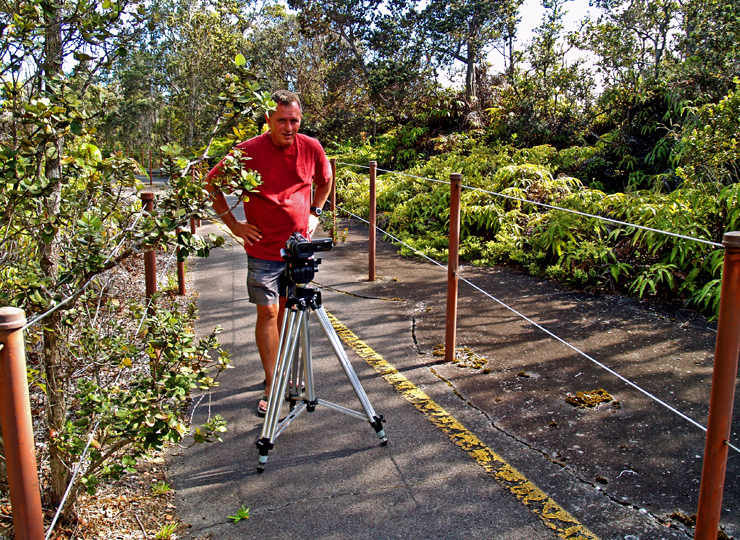 When John Forbes arrived minutes later at HVO, on the edge of Kilauea caldera, he was greeted by the top of a huge lava fountain rising above the rim of Halema`uma`u. The crater was then nearly 245 m (800 ft) deep—more than twice its current depth from the rim to the crater’s floor. By the time Gordon Macdonald arrived at HVO some 10 minutes later, the fountain was no longer visible, but incandescent fragments could still be seen arcing out of the crater. Quickly grabbing the necessary equipment, Macdonald and Forbes set out by car for Halema`uma`u Crater to make detailed observations. As they followed Crater Rim Drive down onto the western floor of Kilauea caldera—the section of road that is closed today due to ongoing summit activity—they encountered a choking, sulfurous fume cloud so thick that they could barely see the road. The fall of tephra onto the road was so heavy that they were hard-pressed to keep the car moving forward as it plowed through the drifts of pumice. The hail of tephra onto the car, with pieces reaching up to 10 cm (4 inches) across, sand-blasted the car’s exterior to the point that it later had to be repainted and have its windshield replaced. Pressing onward, Macdonald and Forbes passed through the tephra fall and quickly walked to the southeast rim of Halema`uma`u, reaching it about 10 minutes past midnight. When they peered into the crater, they saw a continuous line of lava fountains, 790 m (2,600 ft) in length, crossing the entire crater floor from southwest to northeast and extending part-way up the northeastern crater wall. For the most part, the individual fountains were 15 to 30 m (50 to 100 ft) in height, but a fountain 120 m (400 ft) high jetted up near the bottom of the southwestern wall of the crater—probably a diminished version of the same fountain, at more than 245 m (800 ft) in height, seen minutes earlier from HVO. 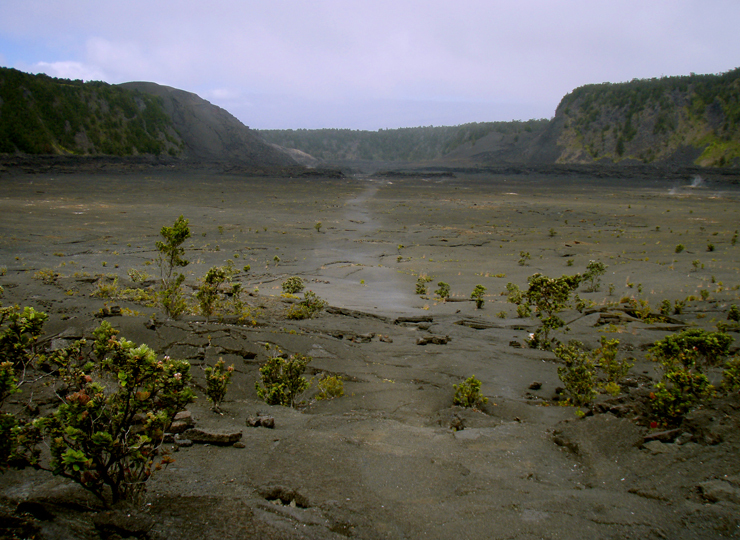 Though views were poor due to the heavy fume, brief glimpses of the crater floor showed that older spatter cones on the floor of Halema`uma`u had already been buried beneath a rising lava lake. This suggested that more than 3 million cubic meters (4 million cubic yards) of lava were erupted in the first half-hour of the eruption. It would take about six days for Kilauea’s current east rift zone eruption to pump out that much lava today. 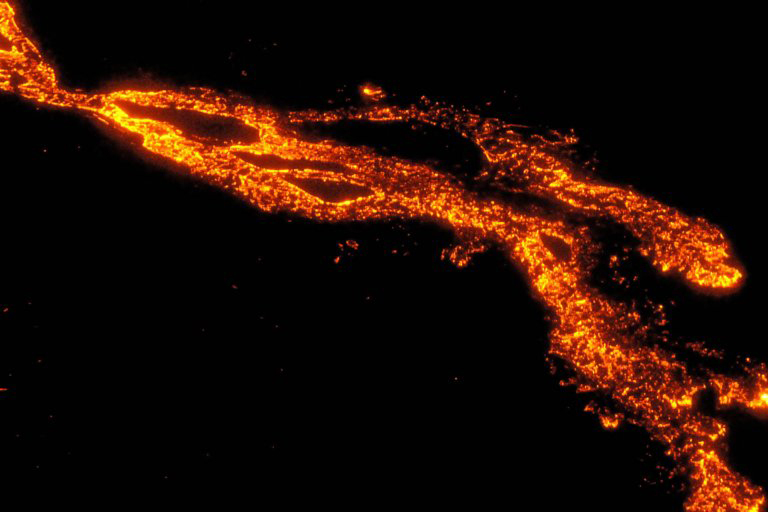 The eruption rate quickly declined after the initial outbreak, but lava fountains continued to play on the surface of the lava lake over the following weeks. By late summer 1952, activity had begun to decline, but the eruption persisted until November 10, when the last fountaining activity was observed. Having erupted for 136 days, the 1952 summit eruption brought to an end, in grand fashion, any doubts as to whether or not Kilauea was still alive. Prior to 1952, Kilauea had been quiescent since October 1934, when the previous summit eruption had ended, and some had begun to think that Kilauea was dead. But frequent earthquakes and the occasional swelling and shrinking of the volcano over the intervening years told volcanologists otherwise. 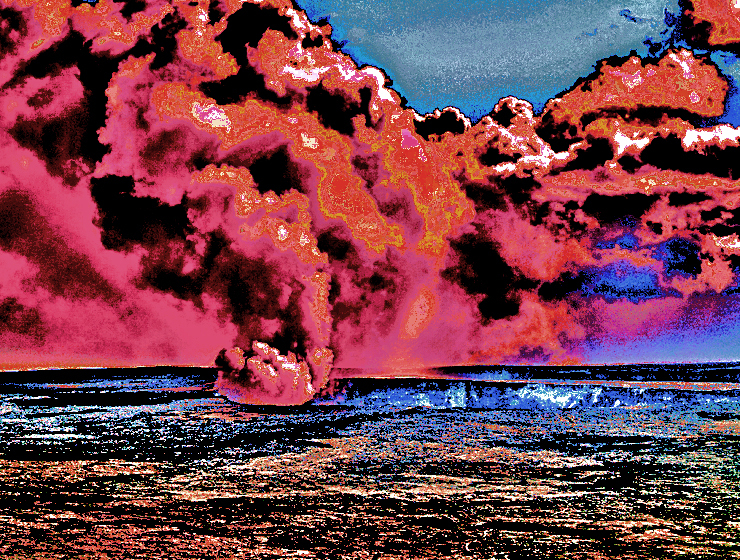 It was no great surprise, then, when the eruption finally occurred. Followed by dozens of eruptions in the years since, the 1952 eruption undoubtedly ushered in the current era of volcanic activity at Kilauea. Today’s ongoing summit and east rift zone eruptions are just the most recent in the string of eruptions that have followed since Mrs. Fox was surprised by the glow outside her living room window. Surface flows in the Royal Gardens subdivision may have stagnated early this past week in response to a deflation-inflation (DI) event at Kīlauea’s summit. Smoke continues to rise, however, from forested kipuka in the subdivision, indicating that at least some burning continues. 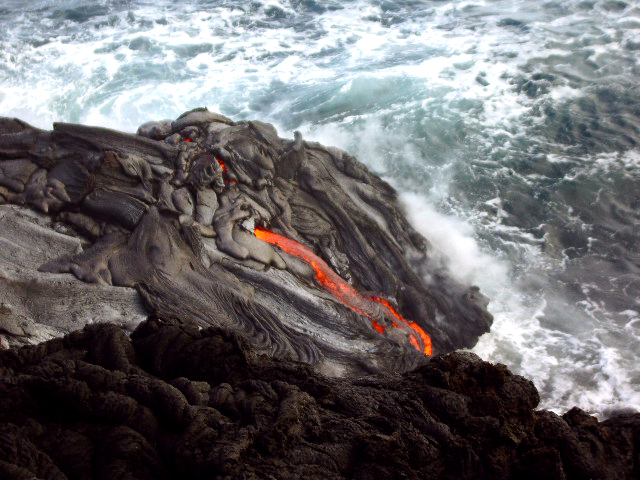 At the coast, the Waikupanaha and Kupapa`u ocean entries remain active and continue to produce prominent plumes, accompanied by small littoral explosions, as lava spills into the ocean. At Kīlauea’s summit, the vent within Halema`uma`u Crater is still emitting elevated amounts of volcanic gas, resulting in high concentrations of sulfur dioxide downwind. 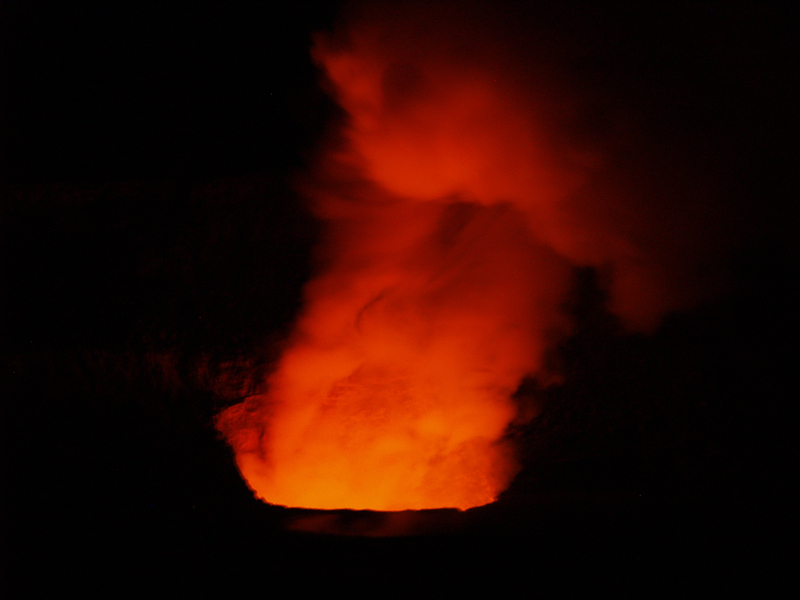 Glow from the vent was visible at night through the past week, and rare views into the vent by HVO scientists found that the lava surface is still present about 205 m (675 feet) below the floor of Halema`uma`u Crater. Visit our Web site (http://hvo.wr.usgs.gov) for detailed Kīlauea and Mauna Loa activity updates, recent volcano photos, recent earthquakes, and more; call (808) 967-8862 for a Kīlauea activity summary; email questions to askHVO@usgs.gov. Volcano Watch is a weekly article and activity update written by scientists at the U.S. Geological Survey’s Hawaiian Volcano Observatory. For more information on traveling to Hawaii in general and exploring the Big Island’s volcanoes in particular, please also visit www.tourguidehawaii.com and www.tourguidehawaii.blogspot.com. In most sciences, processes are investigated by identifying the factors that affect them and varying each factor, in turn, to determine its contribution. In field geology, this is difficult; instead, we compare and contrast events or locations to learn more about the processes. At Kīlauea, there is a long, well-documented history with which to compare and contrast current activities. Summit events at Kīlauea over the last year have been unique since 1924, but bear interesting similarities to lulls in lava lake activity prior to 1924. 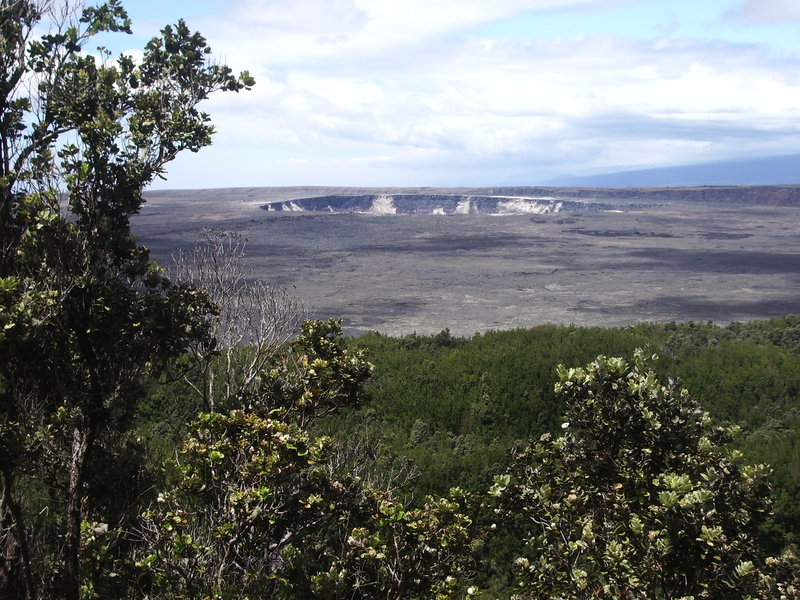 It is well known that, until 1924, there was a nearly continuous lake of lava in Halema`uma`u Crater, which was less than half the diameter it is today. But “nearly continuous” means there were periods when the lava lake disappeared. Mid-1913 to late 1914 was one of those periods when the crater was filled with fume, but not lava. Fortunately, regular Hawaiian Volcano Observatory (HVO) reports described this lull. In 1913, HVO was located where the Volcano House hotel is today. 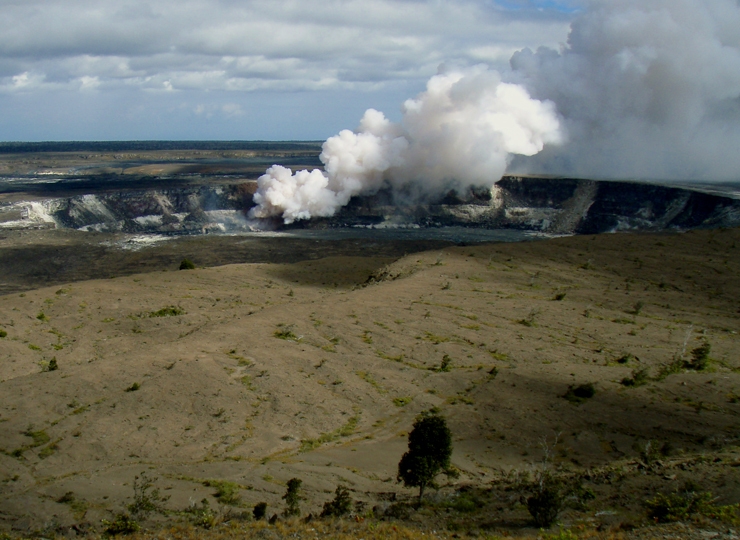 Lacking direct views into Halema`uma`u Crater, observers noted sounds and characteristics of the fume coming from the pit to describe its behavior. Reports of glow were infrequent, but descriptions of noises from the crate-blowing, coughing, booming, hissing, rumbling, grumbling, puffing, and breathing-were common. Rock slides, which were frequent and audible, sometimes produced dust clouds. “During the last three months the only marks of activity which have fluctuated have been noises of blowing and rumbling, greater or less suffocating quality to the fumes when breathed, and very rare glimpses of flame seen two or three times at night.” (HVO report, August 18, 1913). Through September, the noises increased in intensity, and some glow was observed. Pele’s hair was frequently found downwind of the crater and, when the fumes cleared, glimpses of a lava vent deep in Halema`uma`u Crater could be seen. 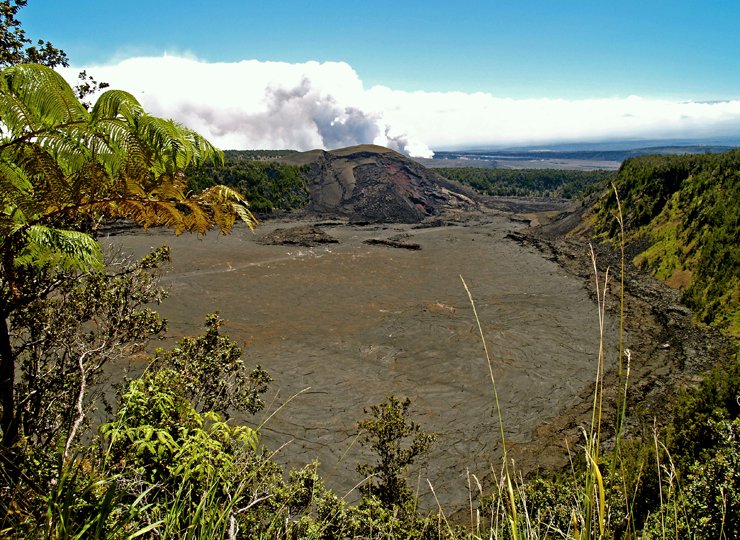 By October 20, 1913, Halema`uma`u Crater was considered to be in a minor eruptive phase. The crater was emitting much greater volumes of fume than in August. 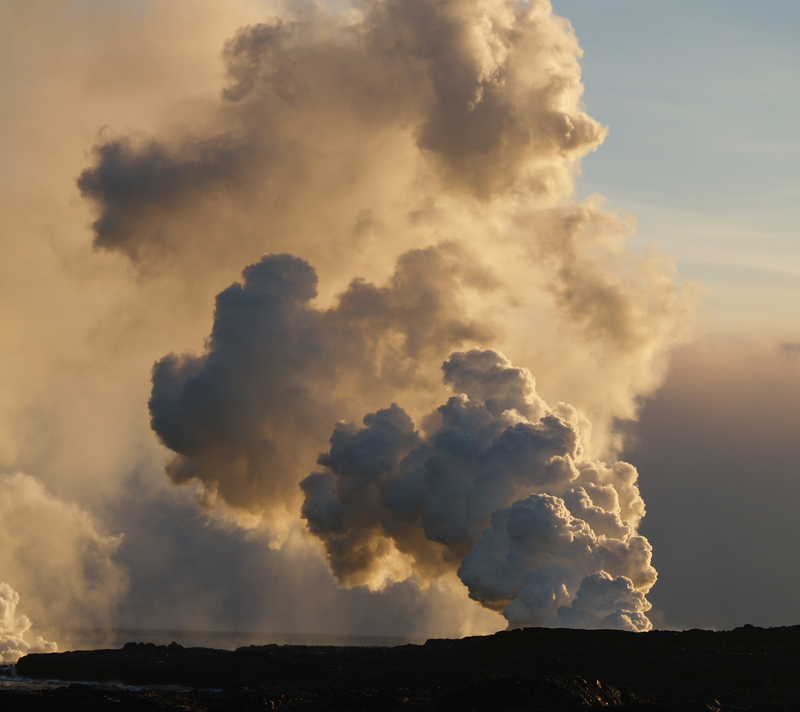 Sounds resembling “swashing liquid” suggest the continued existence of a lava lake, even when it was obscured by fume. A glow-lit fume cloud was a frequent sight over the crater at night. Activity decreased through the end of 1913, and Halema`uma`u finished the year in a “semi-dormant” state, with a crater shaped like a huge funnel about 200 m (600 ft) deep and a thickly crusted lava pool in its bottom. Vigorous lava lake activity did not resume until late 1914. Jump ahead to 2008. HVO reports have been describing many of the same characteristics. Few views of a lava pond have been recorded, but blowing and booming sounds, rock falls, and dust plumes have been common. Explosions were common in much of 2008, and some were energetic enough to erupt material to the crater rim. The 1913-14 lull in activity and the currently elevated summit activity both result from lava being at similar shallow depths below Halema`uma`u Crater. In the early part of 1913, lava dropped to that level. In early 2008, magma rose to a similar depth. The 2008 activity produced small amounts of tephra, often including Pele’s hair. The 1913-14 lull also produced notable amounts of Pele’s hair, but production of other tephra was not recorded. Throughout both events, progress is highly variable. The overall rise of lava in the crater during 1913 and 1914 was halting, with episodes of rise repeatedly cut short with episodes of subsidence. Similarly, the 2008 activity changes several times a week, with lava interpreted to be rising and falling within the conduit below the vent. In both cases, shallow magma produced elevated SO2 emissions and glow from the vent. “Fumes continue to pour out without abatement” (HVO report, February 4, 1914). Observers commonly described the fume as being difficult to breathe in 1913. Respiratory protection is required to work in the fume emitted today but probably wasn’t necessary in earlier years. HVO continues to monitor Kīlauea’s activities and we hope to learn more by comparing recent events with past volcanic activity. Kīlauea Volcano continues to be active. A vent in Halema`uma`u Crater is emitting elevated amounts of sulfur dioxide gas and producing small amounts of ash. Resulting high concentrations of sulfur dioxide in downwind air have closed the south part of Kīlauea caldera and produced occasional air quality alerts in more distant areas, such as Pahala and communities adjacent to Hawai`i Volcanoes National Park, during kona wind periods. A collapse deep within the vent on Wednesday, February 4 produced a robust brown plume and appeared to reopen the conduit, filled with rubble since early December. Views inside the vent the next day with a thermal camera showed a small, crusted lava pond more than 100 yards below the vent rim. 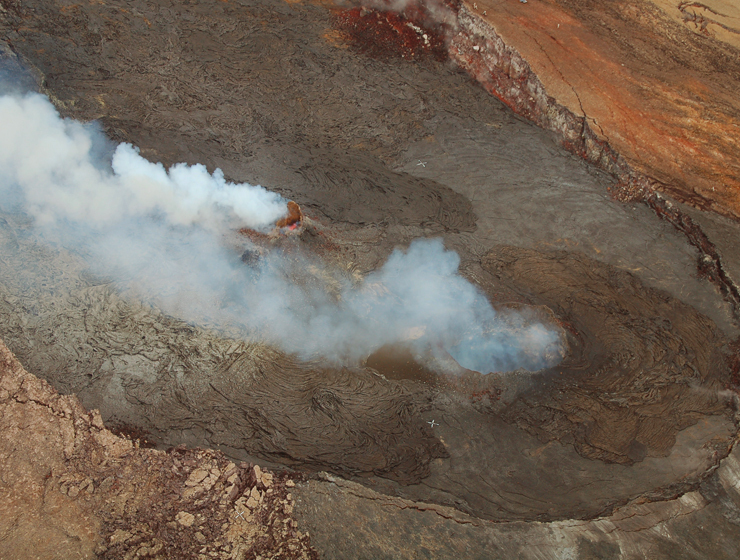 Pu`u `Ō`ō continues to produce sulfur dioxide at even higher rates than the vent in Halema`uma`u Crater. 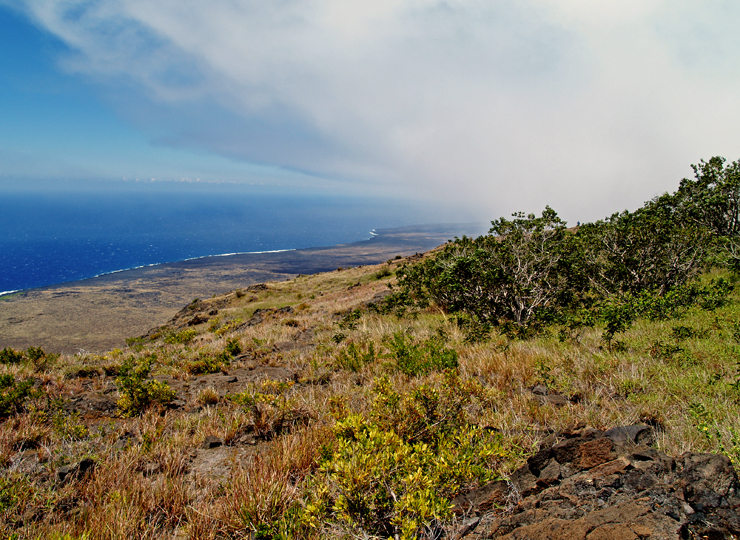 Trade winds tend to pool these emissions along the West Hawai`i coast, while Kona winds blow these emissions into communities to the north, such as Mountain View, Volcano, and Hilo. 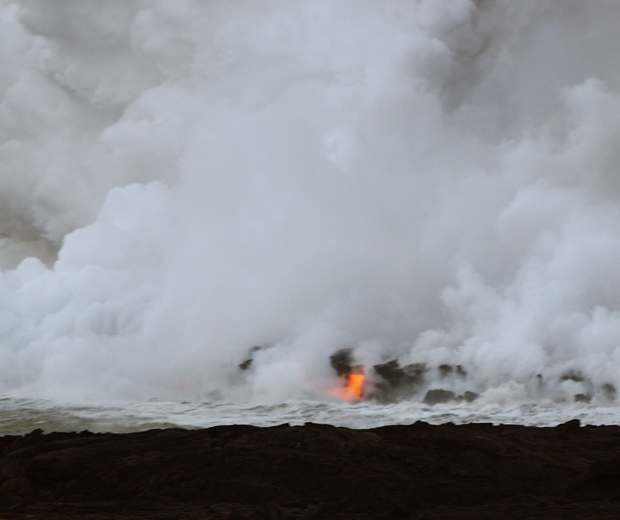 Lava erupting from the Thanksgiving Eve Breakout (TEB) vent at the eastern base of Pu`u `Ō`ō continues to flow to the ocean at Waikupanaha through a well-established lava tube. Breakouts from a western branch of the lava tube were active on the coastal plain near the National Park boundary early in the week and also continued to feed the small ocean entry near Waha`ula. A deflation-inflation cycle beginning February 3 led to a short-term reduction in lava supply to the flow field. Surface flows and ocean entries were inactive on Thursday, February 5, and will probably resume shortly. Be aware that active lava deltas can collapse at any time, potentially generating large explosions. This may be especially true during times of rapidly changing lava supply conditions. The Waikupanaha delta has collapsed many times over the last several months, with three of the collapses resulting in rock blasts that tossed television-sized rocks up onto the sea-cliff and threw fist-sized rocks more than 200 yards inland. Do not approach the ocean entry or venture onto the lava deltas. Even the intervening beaches are susceptible to large waves generated during delta collapse; avoid these beaches. In addition, steam plumes rising from ocean entries are highly acidic and laced with glass particles. Call Hawai`i County Civil Defense at 961-8093 for viewing hours. Mauna Loa is not erupting. No earthquakes were located beneath the summit this past week. Continuing extension between locations spanning the summit indicates slow inflation of the volcano, combined with slow eastward slippage of its east flank. Three earthquakes beneath Hawai`i Island were reported felt within the past week. A magnitude-3.2 earthquake occurred at 3:37 p.m., H.s.t., on Friday, January 30, 2009, and was located 2 km (1 mile) east of Pahala at a depth of 10 km (6 miles). A magnitude-3.4 and a magnitude-3.5 earthquake occurred at 7:12 and 7:17 p.m., respectively, on the same Friday and were located 7 km (4 miles) west of Kalapana at a depth of 9 km (6 miles). Visit our Web site (http://hvo.wr.usgs.gov) for daily Kīlauea eruption updates, a summary of volcanic events over the past year, and nearly real-time Hawai`i earthquake information. Kīlauea daily update summaries are also available by phone at (808) 967-8862. Questions can be emailed to askHVO@usgs.gov. For more information on traveling to Hawaii in general and seeing the volcanoes of the Big Island in particular, please visit www.tourguidehawaii.com and www.tourguidehawaii.blogspot.com. A montage of some of my favorite footage that Frank and I have shot of the Kilauea eruption, from the active vents at Pu’u O’o and Kupaianaha to the ocean entry at Waikupanaha, as well as day and night time footage of the summit eruption at Halema’uma’u. Sit back, turn up the speakers and enjoy–I’ve even recorded a new piece of music to go with it. Produced by Donald B. MacGowan; videography by Frank Burgess and Donald MacGowan; Original music written and performed by Donnie MacGowan. For more information about traveling the Big Island in general and exploring Hawaii Volcanoes National Park in particular, visit www.tourguidehawaii.com and www.tourguidehawaii.blogspot.com. More information about the producer can be found here and here. 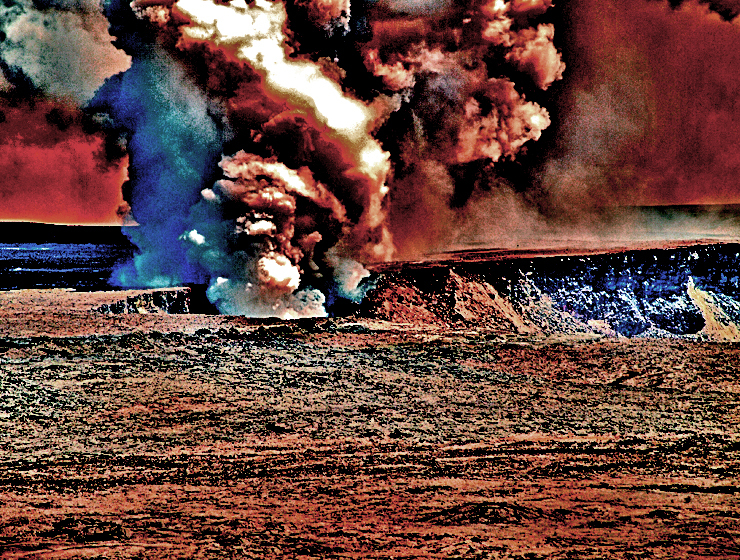 Sulfur dioxide emissions from the Pu`u `Ō `ō vent on Kilauea's east rift (right foreground), and the summit vent in Halema`uma`u Crater (in front of Mauna Loa, left background), were being blown to the northeast by winter winds in this January 14, 2009, USGS photo. What’s white and wet and green all over? Hint: this is a household problem that Big Island residents on rainwater catchment share with the citizens of Sweden. Answer: a bathtub or wash basin coated with green copper sulfate. For newcomers to the island, it may be reassuring to learn that the green stuff on your plumbing fixtures is a mineral, not a vegetable. The sulfuric acid in our rain leaches copper from pipes and combines with soap to form copper sulfate that adheres to tubs. Most of us know that we can thank our active volcano for the acidic rain. The ongoing summit and east rift eruptions of Kilauea are emitting 2,000 to 3,000 tons of sulfur dioxide (SO2) into the atmosphere every day. SO2 and other volcanic gases interact with the atmosphere and sunlight to form sulfate particles and tiny droplets of sulfuric acid. This mixture is responsible for both acid rain and the haze we call vog. But what about those green bathtubs in Sweden? By the 1970s, Scandinavians were also suffering from acid rain. With their high per-capita level of blondes, the Swedes were even reporting a problem with green hair. Unfortunately for them, the source of their pollution wasn’t a captivating volcano, but rather the heavily industrialized areas of Germany and Britain, where SO2 is created by burning sulfur-contaminated coal. The most severe consequences of exposure to SO2 occurred in London in 1952, when a temperature inversion capped the city for four days, trapping a “black fog” of polluted air close to the ground. Many people died on the streets, and, in the end, 4,000 deaths were attributed to the smog. The primary cause of death was inhalation of SO2 and particulates created by coal-fired power plants and home furnaces. The U.S. Clean Air Act of 1970 and similar measures in Western Europe resulted in much cleaner cities. However, some of this improvement was achieved by building ever taller smoke stacks, which caused the emissions to be carried hundreds of miles downwind, where hitherto pristine areas were plagued with acid rain. Acidification of lakes and soil in the U.S. northeast and Canada killed fish, damaged forests, and leached toxic metals into water supplies. In 1990, Congress mandated that coal-fired power plants had to cut their SO2 emissions in half by 2010. Many plants found that meeting the new standards was more easily and cheaply achieved than first assumed, by switching to low-sulfur coal from Wyoming’s vast strip mines. Too bad Kilauea can’t switch to low-sulfur magma! Since the new vent opened at the summit in March, SO2 emissions have increased by about 50 percent and vog impacts, especially to communities close to the source, have become even more serious. In addition to creating hazardous situations for people with respiratory ailments, farmers have suffered significant losses, prompting a disaster declaration from the USDA. A recent publication from the University Agricultural Extension Service, http://www.ctahr.hawaii.edu/oc/freepubs/pdf/PD-47.pdf, provides farmers with information on how to apply for relief funding. It is also useful for the home gardener, as it lists varieties of plants known to be susceptible to vog and has suggestions for helping to protect vulnerable plants. For more information, visit our Frequently Asked Questions list online at http://hvo.wr.usgs.gov/hazards/FAQ_SO2-Vog-Ash/main.html. Hawai`i County has advisories and a mitigation brochure on their website at http://www.lavainfo.us/. The State of Hawai`i also has online information at http://hawaii.gov/gov/vog. Kīlauea Volcano continues to be active. A vent in Halema`uma`u Crater is emitting elevated amounts of sulfur dioxide gas and has resumed producing small amounts of ash. Resulting high concentrations of sulfur dioxide in downwind air have closed the south part of Kīlauea caldera and produced occasional air quality alerts in more distant areas, such as Pahala and communities adjacent to Hawai`i Volcanoes National Park, during kona wind periods. An increase in glow, gas-rushing sounds, and ash production over the past week indicates that lava may have risen to a shallower level beneath the vent. Lava erupting from the Thanksgiving Eve Breakout (TEB) vent at the eastern base of Pu`u `O`o continues to flow to the ocean at Waikupanaha through a well-established lava tube. Breakouts from a western branch of the lava tube were active on the coastal plain near the National Park boundary in the past week and reached the ocean late on January 21 or early January 22. This tiny, new ocean entry is located very close to the long-buried Waha`ula Heiau and National Park visitor center. Mauna Loa is not erupting. Two earthquakes were located beneath the summit this past week. Continuing extension between locations spanning the summit indicates slow inflation of the volcano, combined with slow eastward slippage of its east flank. Two earthquakes beneath Hawai`i Island were reported felt within the past week. A magnitude-3.9 earthquake occurred at 2:55 a.m., H.s.t., on Sunday, January 17, 2009, and was located 9 km (5 miles) south and offshore of Kalapana at a depth of 42 km (26 miles). A magnitude-3.1 earthquake occurred at 6:23 a.m. on Thursday, January 22, and was located 11 km (7 miles) southeast of Waiki`i at a depth of 11 km (7 miles). For more information on traveling to Hawaii in general, and for seeing the eruptions at Kilauea in particular, visit www.tourguidehawaii.com and www.tourguidehawaii.blogspot.com. Volcano Update! Halemaumau Eruption is Longest on Kilauea Summit in 84 Years! 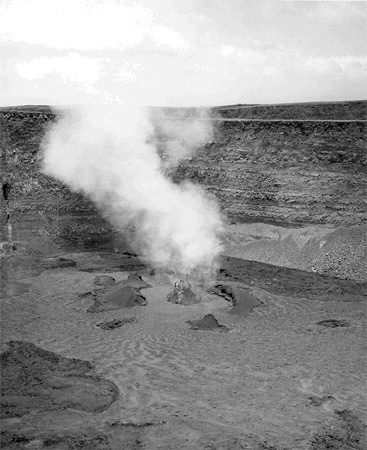 This plume, erupting from Halema`uma`u in 1934, is remarkably similar in appearance to the plume erupting from the crater today. USGS photograph. The current volcanic activity in Halema`uma`u Crater is now Kilauea’s longest summit eruption since 1924. 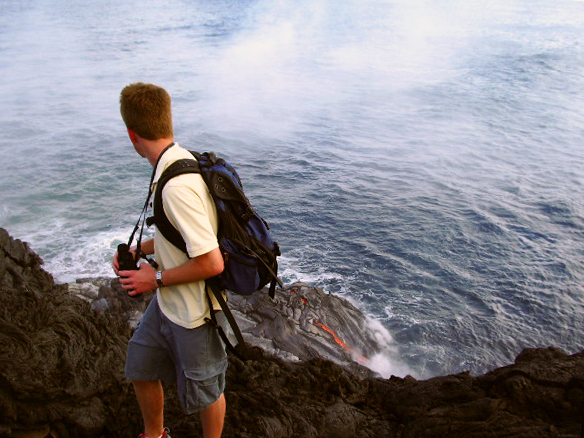 On November 25, 2008, it exceeded the previous record set in 1967-68, when lava erupted in Halema`uma`u for 251 days. Newspaper articles tracking the 1967-68 eruption reported each time it reached a landmark length set by prior Halema`uma`u events. When it finally surpassed the 136-day record set in 1952, headlines touted the eruption as the second longest of the century. Shortly after the 1967-68 eruption ended, Dr. Howard Powers, Scientist-in-Charge of the Hawaiian Volcano Observatory at the time, put its duration in perspective by noting that, historically, a summit eruption is the “normal” for Kilauea Volcano. He no doubt was referring to the 100-plus years of nearly continuous lava lake activity at Kilauea’s summit prior to 1924. We use 1924 as a frame of reference for Halema`uma`u eruptions because, in the 19th and early 20th centuries, the crater looked nothing like it does today. It was an irregular landscape of craggy spires and islands with as many as four transient lava lakes. In 1924, the long-lived lava lake drained, causing the crater walls to collapse and explosive eruptions that doubled the diameter of Halema`uma`u to about 900 m (3,000 ft). The crater looked much the way we see it now, except that it was over 400 m (1,300 ft) deep—almost five times deeper than it is today. Since the fateful events of May 1924, Halema`uma`u has erupted 18 times. The first was just two months later, in July 1924, when an 11-day eruption formed a “puddle” of lava on the crater floor. Over the next 10 years, six eruptions—in 1927, 1929 (two), 1930, 1931, and 1934—took place within Halema`uma`u. They varied in duration from 2 to 33 days, but each eruption added a layer of molten rock to the crater floor. With thicknesses averaging about 18 m (60 ft), these layers reduced the depth of Halema`uma`u to about 245 m (800 ft). 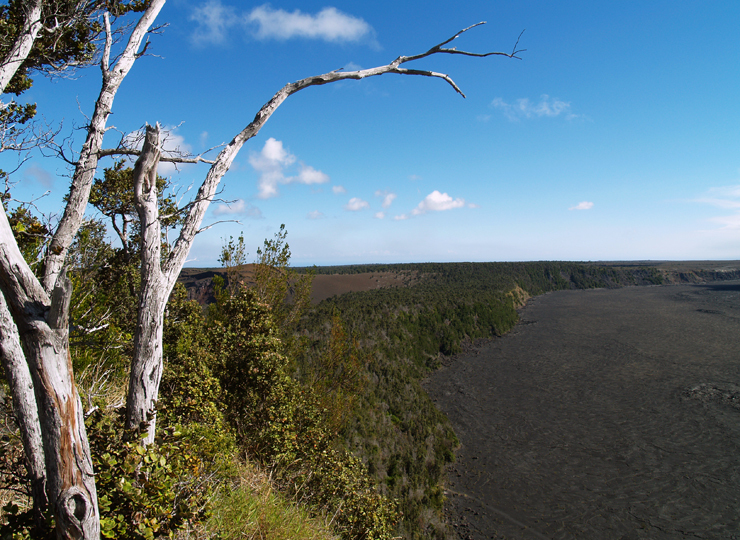 The end of the 1934 eruption marked the beginning of Kilauea’s longest period of quiet on record. For nearly 18 years, there were no eruptions anywhere on the volcano. 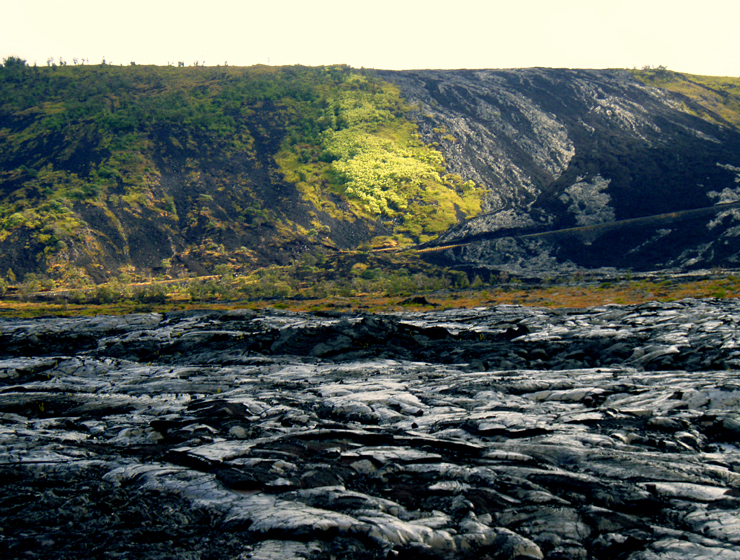 Kilauea made up for lost time when molten lava returned to Halema`uma`u in June 1952. The spectacular eruption went on for 136 days, with lava fountains sometimes visible above the crater rim. By the time it ended, the eruption had pumped more than 120 m (390 ft) of new lava into the crater. During the next 30 years, Halema`uma`u erupted nine times—in 1954, 1961 (three), 1967-68, 1971, 1974, 1975, and 1982. These eruptions varied greatly in duration, from about 7 hours in 1975 to 251 days in 1967-68. The volume of extruded lava also varied, with the most—84.1 million cubic meters (110 million cubic yards)—erupted in 1967-68. Surprisingly, some of the shorter eruptions were quite voluminous. 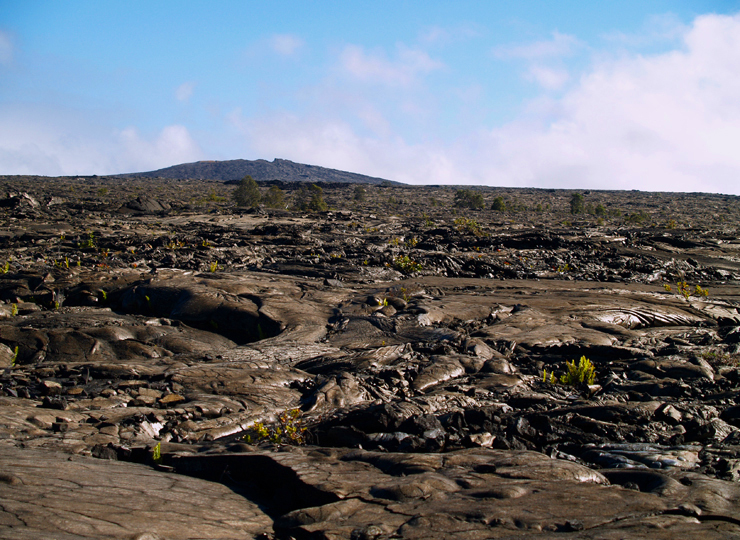 Most of the rock covering the floor of Halema`uma`u today was emplaced during the short-lived 1974 eruption. Ten million cubic meters (13 million cubic yards) of molten lava quickly engulfed the entire crater floor, except for the tops of three high spatter cones from the 1967-68 eruption. Each Halema`uma`u eruption that took place between 1924 and 2008 has its own unique story. Some are hair-raising, as in 1931, when a USGS engineer had to run for his life to escape sulfur dioxide fumes that overtook him at the crater rim. Most of them, however, describe activity strikingly similar to what we are experiencing today—gas emissions, ash-rich plumes, eruptions of frothy lava, and poor air quality. The story of the 18th—and longest—Halema`uma`u eruption since 1924 is unfolding before our eyes. So far, it differs from the previous eruptions in that molten lava is not visible on the crater floor. Lava is close to the surface, though, as evidenced by ash, pumice, and spatter ejected to the crater rim and by a few rare glimpses of molten rock in the vent. How long the current eruption will last and whether lava will flow on to the crater floor remain anyone’s guess. But, as of November 25, 2008, Halema`uma`u reached another milestone. Kīlauea Volcano continues to be active. A vent in Halema`uma`u Crater is erupting elevated amounts of sulfur dioxide gas and very small amounts of ash. Resulting high concentrations of sulfur dioxide in downwind air have closed the south part of Kīlauea caldera and produced occasional air quality alerts in more distant areas, such as Pahala and communities adjacent to Hawai`i Volcanoes National Park, during kona wind periods. There have been several small ash-emission events from the vent, lasting only minutes, in the last week. Lava continues to erupt from the Thanksgiving Eve Breakout (TEB) vent and flow toward the ocean through a well-established lava tube. Lava breakouts in the Royal Gardens subdivision have been active throughout the past several weeks, sending flows onto the coastal plain. As of Monday, December 1, these active flows were within 200 yards of the National Park boundary. Activity at the Waikupanaha ocean entry continues, with occasional small explosions. A deflation-inflation cycle began at the summit early on December 4, and was still ongoing at the time of this writing (afternoon of December 4). These cycles normally cause short-term fluctuations in lava supply to the flow field. Be aware that active lava deltas can collapse at any time, potentially generating large explosions. This may be especially true during times of rapidly changing lava supply conditions. Do not venture onto the lava deltas. Even the intervening beaches are susceptible to large waves generated during delta collapse; avoid these beaches. In addition, steam plumes rising from ocean entries are highly acidic and laced with glass particles. Check Civil Defense Web site (http://www.lavainfo.us) or call 961-8093 for viewing hours. Mauna Loa is not erupting. One earthquake was located beneath the summit this past week. Continuing extension between locations spanning the summit indicates slow inflation of the volcano. No earthquakes were felt on Hawai`i Island in the past week. For more information on traveling to Hawaii in general and touring the Big Island in Particular, visit www.tourguidehawaii.com and www.tourguidehawaii.blogspot.com. For the past month, Kīlauea’s summit eruption has been steadily chugging along. 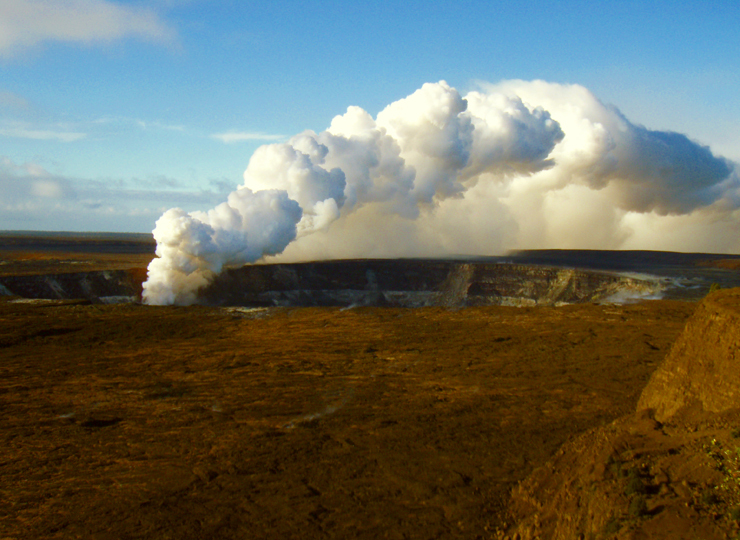 Clattering sounds issue from the Halema`uma`u vent as gas pulses forth, forming a thick plume that rolls into white billows high above the caldera. 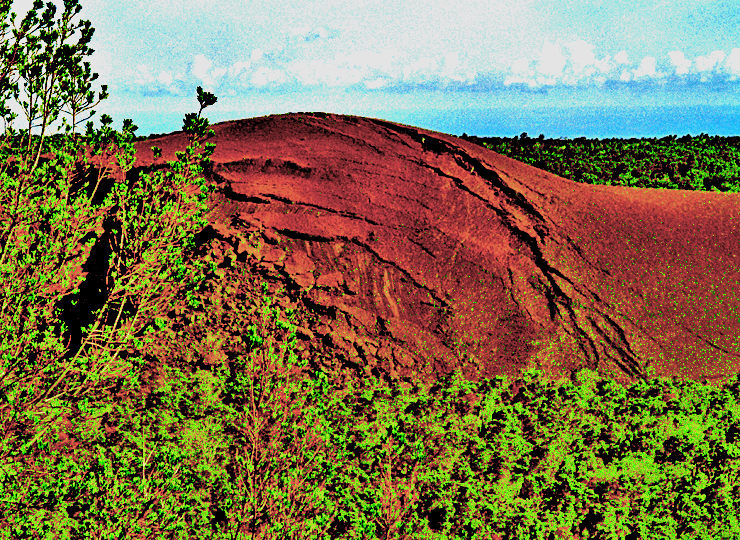 On most days, the plume rises and turns above the summit, gently drifting southward and darkening the Ka`u landscape. In the distance, an endless train of fume wraps around the flanks of Mauna Loa, destined for Kona and other points on the island chain. the chugging engine had seized. But, just as suddenly as it paused, it resumed a few minutes later, and the thick plume returned, puffing high above the caldera. This cycle of robust and wispy plumes occurred several more times on Monday and into the next day. On Tuesday morning, HVO geologists made their way to the crater’s edge and were standing above the vent through four of these plume transitions. Instead of a continuous flow of fume and occasional clatter, they witnessed something far more curious. When the plume became weak and wispy, the faint roar of surf, usually a common sound, was barely audible. Then, suddenly, they heard the loud and intimidating sound of breaking glass, followed by the rushing return of a thick white plume. During these changes, cameras captured images and instruments recorded temperatures as glow returned to the vent. The glow intensity and associated temperatures were the highest observed since mid-October. The amount of material ejected onto the crater rim also increased to its highest level since mid-October. This material largely consists of Pele’s hair and other glassy fragments suggestive of fresh lava. So, what is happening at the vent and why has it changed? Our explanations of natural phenomena are always working hypotheses that are refined as more data become available. At this stage, our data suggest that lava may be pistoning (rising and falling) within the vent. 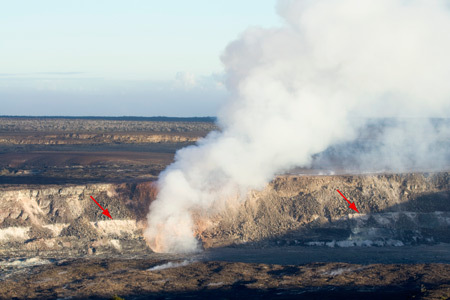 When pistoning occurs, lava rises within the conduit to a level perhaps within 100 meters (300 feet) of the vent rim. As the lava cools, a crust forms on its surface. This crust can impede the flow of gas, causing pressure to build within the lava. When enough pressure is built to break the crust, gas can rush forward. The reduction in gas pressure causes the lava piston to drop down within the vent, and the cycle starts again. lauea. For example, seismic tremor recorded at the summit in recent days is reminiscent of tremor produced at Pu`u O`o several years ago, when lava filled and drained from vents within its crater. The sound of breaking glass heard within the vent may be caused by shattering of the glassy crust on the lava-piston’s surface. The increase in glassy lava fragments deposited on the rim of Halema`uma`u is probably the result of this sequence. Periods of intense glow observed at night could also be explained by the pistoning. When the crust breaks up and the lava level drops, red-hot molten lava and incandescent vent walls are exposed, increasing the intensity of the glow. An explanation for changes deep within the volcano causing this pistoning behavior is more ambiguous. Whatever the reasons are for the shift in summit activity, we are sure that the engine is still chugging. 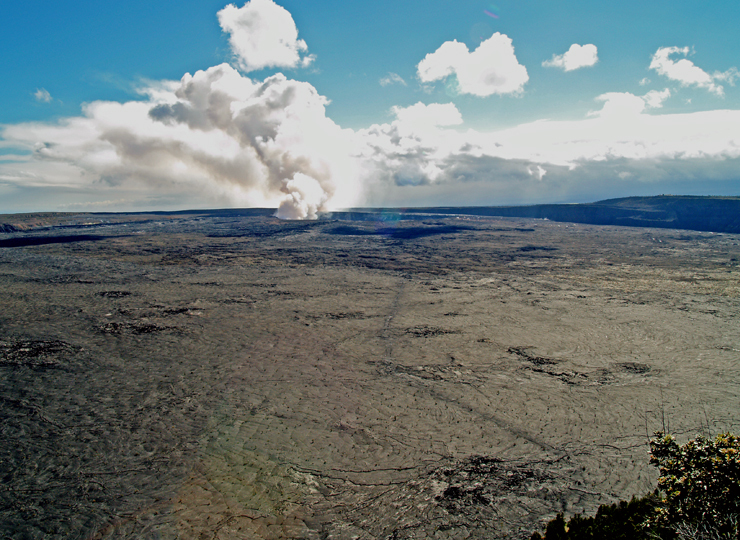 lauea caldera and produced occasional air quality alerts in more distant areas, such as Pahala and communities adjacent to Hawai`i Volcanoes National Park, during kona wind periods. The have been several small ash-emission events from the vent, lasting only minutes, in the last week. For a few days mid-week, there were several brief periods of decreased plume vigor lasting minutes to hours. During these periods, the plume was the weakest it has been since the vent opened last March. 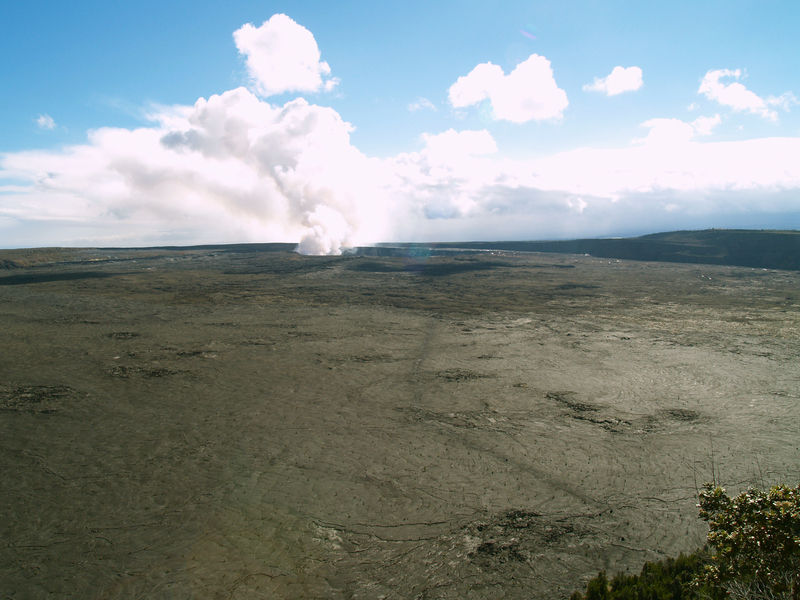 continues to produce sulfur dioxide at rates higher than the vent in Halema`uma`u Crater. Trade winds tend to pool these emissions along the West Hawai`i coast, while Kona winds blow these emissions into communities to the north, such as Mountain View, Volcano, and Hilo. Lava continues to erupt from the Thanksgiving Eve Breakout (TEB) vent and flows toward the ocean through a well-established lava tube. Activity at the Waikupanaha ocean entry has fluctuated over the past week, with periods of small littoral explosions and a voluminous plume, followed by periods of no explosions and a wispy plume. Part of these fluctuations may have occurred in response to a deflation-inflation (DI) event at Kilauea’s summit on November 16-17. 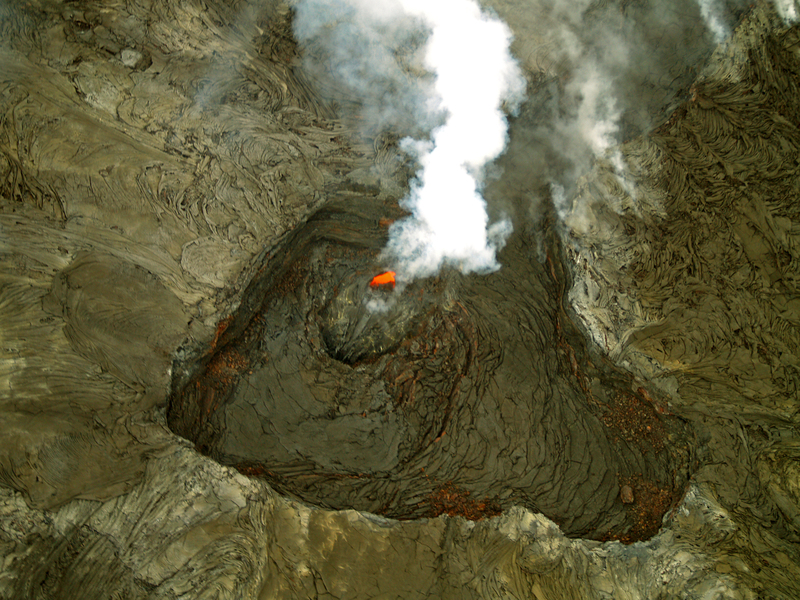 A western branch of the tube, which diverges from the main TEB tube at the top of the pali, continues to supply lava to breakouts on the coastal plain. These breakouts are scattered along the western margin of the TEB flow field and are slowly marching southward toward the National Park boundary. Be aware that active lava deltas can collapse at any time, potentially generating large explosions. This may be especially true during times of rapidly changing lava supply conditions. Do not venture onto the lava deltas. Even the intervening beaches are susceptible to large waves generated during delta collapse; avoid these beaches. In addition, steam plumes rising from ocean entries are highly acidic and laced with glass particles. Check the Civil Defense Web site (http://www.lavainfo.us) or call 961-8093 for viewing hours. Mauna Loa is not erupting. Two earthquakes were located beneath the summit this past week. Continuing extension between locations spanning the summit indicates slow inflation of the volcano. There were no felt earthquakes reported on Hawai`i Island for the past week. For more information on visiting Hawaii in general and touring the Big ISland in particular, go to www.tourguidehawaii.com and www.tourguidehawaii.blogspot.com. Red arrows point to the “bathtub ring,” or high-lava mark, from the 1967-68 eruption in Halema’uma’u Crater. The light-colored ring, composed of rocks altered by acidic gases, is obscured in places by later rockslides from the unstable crater walls. Have you ever noticed the “bathtub ring” in Halema`uma`u? Look into the crater from Jaggar Overlook—or via HVO’s Halema`uma`u Webcam—and you’ll see a distinct band of light-colored rocks extending about halfway up the crater wall. Those rocks delineate the high-lava mark of a lake of molten rock erupted 41 years ago. It all began at 2:32 a.m. on Sunday, November 5, 1967, when a line of vigorously erupting vents opened on the floor of Halema`uma`u Crater. Up to a dozen fountains spewed lava 60-75 m (200-250 feet) into the air while sulfur fumes billowed skyward in a large white cloud. Molten rock covered the entire crater floor with a lava lake, the surface of which rose as much as 4 m (12 feet) per hour. At night, incandescence reflected in the fume cloud created a glow that was visible all the way to Hilo. When the fountains abruptly ceased 22.5 hours later, the lava lake was 31 m (103 feet) deep, but molten rock immediately began draining back into the vents. This drainback lowered the lake level by 14 m (45 feet), leaving jagged islands of crusted lava standing on the lake surface. On November 7, a local newspaper headline declared “Eruption Officially Pau,” but HVO scientists weren’t convinced it was truly over. Renewed inflation at Kilauea’s summit soon after the fountains died suggested otherwise. Two days later, increased harmonic tremor signaled the onset of another eruptive phase. During the 11-day second phase, robust fountains in the center of the new lake threw lava 15-30 m (50-100 feet) into the air. This eruption differed from the previous phase in that a levee of crusted lava confined a perched pool of molten lava that grew over 30 m (100 feet) high. Lava occasionally overflowed the levee, spilling out to cover about half of the crater floor. When the eruption ended, lava again drained back into the vents, causing the lake center to drop about 6 m (20 feet). This pattern of activity—harmonic tremor, lava extrusion and lake overflow, summit deflation, partial drainback and summit reinflation followed by a period of quiet—occurred repeatedly over the next eight months. As the lake continued to grow, the floor of the crater began to resemble late 19th and early 20th century paintings and photographs of Halema`uma`u. These things led HVO scientists to wonder whether Kilauea was returning to its pre-1924 activity, when Halema`uma`u maintained a nearly continuous lake of lava. In all, 31 eruptive phases pumped 84 million cubic meters (110 million cubic yards) of lava into Halema’uma`u Crater. Phases varied in duration and intensity, ranging from a low-key phase that lasted only 8 hours, to one that continued for 68 days. By phase 16, lava fountains were characterized by massive bubbling rather than the tall bursts observed in earlier phases. Periods of quiet between eruptive phases varied from 12 hours to six days. Not surprisingly, thousands of Hawai`i Island residents and visitors flocked to the Halema`uma`u Crater overlook to witness the eruption. During phase 1 alone, almost 22,000 people braved howling winds, chilly weather, choking sulfur fumes, and the sting of wind-blown pumice and ash for a front-row view. 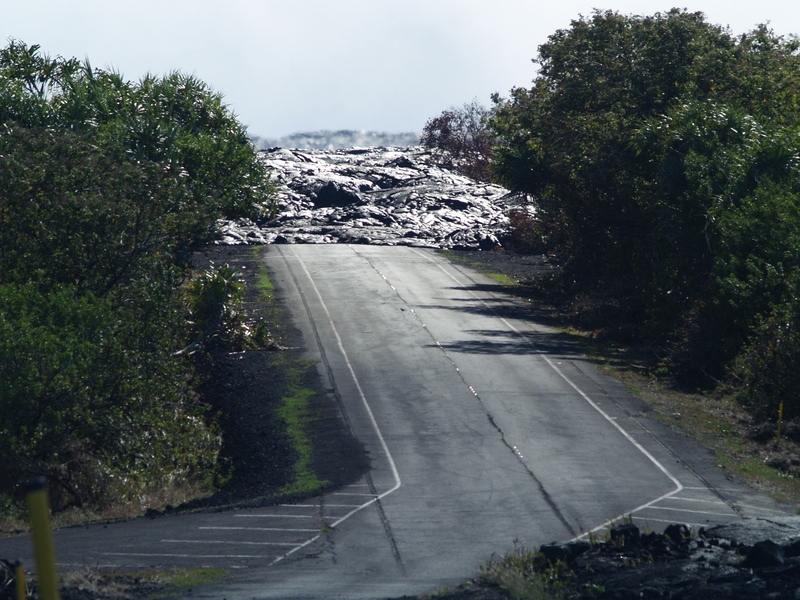 To manage the heavy traffic, Hawai`i Volcanoes National Park Rangers set up a one-way route around Crater Rim Drive. 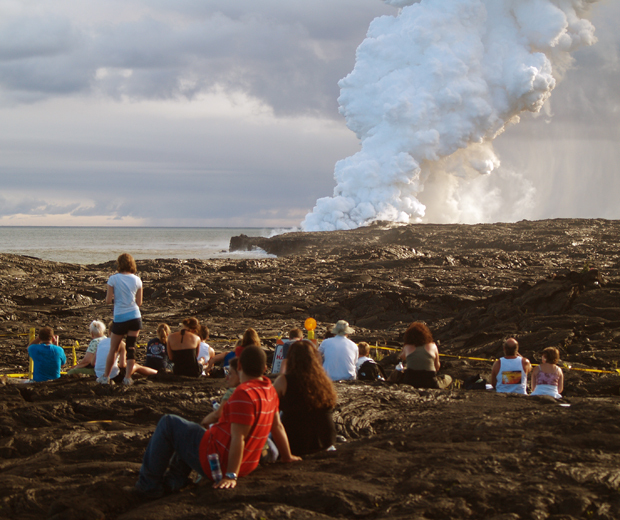 The eruption boosted business on the island’s hotels, tour operators, and rental car agencies. 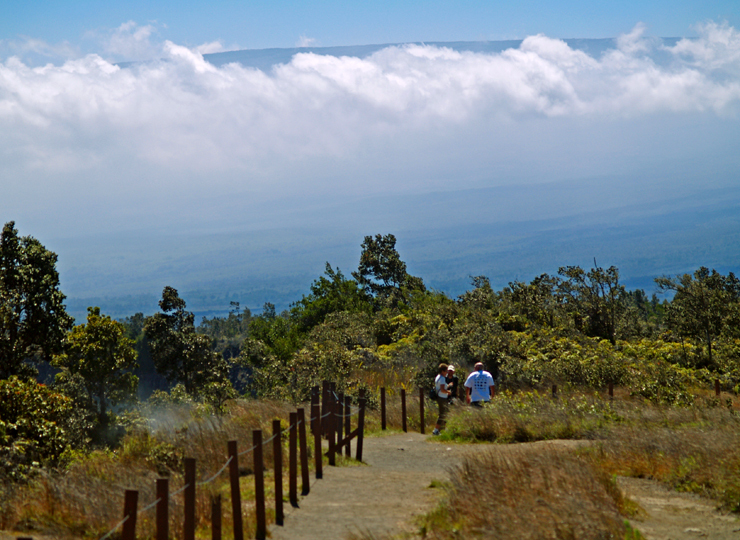 Airlines offered special excursions that circled Halema`uma`u Crater at an altitude of about 460 m (1,500 feet). Because planes were restricted to a counter-clockwise pattern, passengers switched sides after 15 minutes so they could all get a good view. 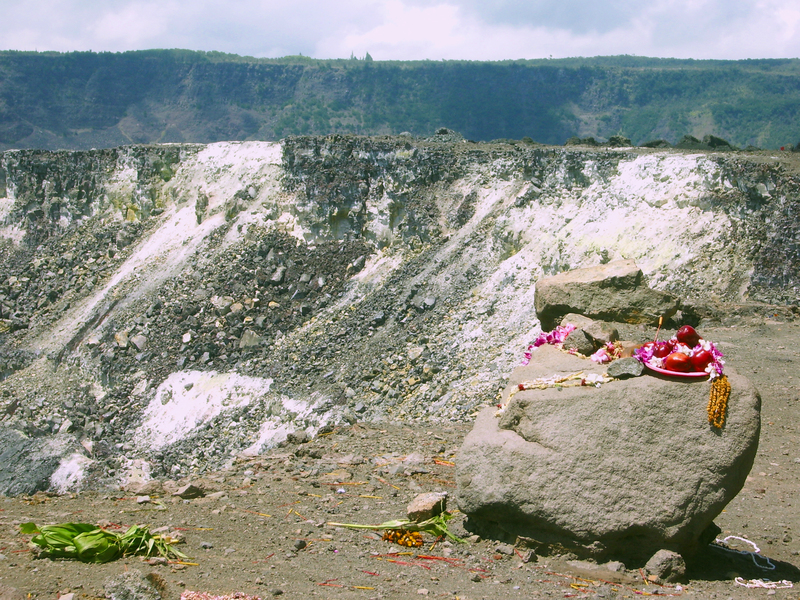 When the eruption started on November 5, 1967, the floor of Halema`uma`u Crater was 170 m (550 feet) deep. By the time the last dribble of molten rock erupted on July 13, 1968, the lava lake had filled the crater to a depth of 110-114 m (360-375 feet). The final drainback left a 15-m (50-foot) depression in the lake surface. The aforementioned bathtub ring wasn’t revealed until September 1971, when a southwest rift zone eruption drained lava from the still-molten interior of the 1967-68 lava lake. This caused the crater floor to collapse about 45 m (150 feet), exposing the high-lava mark you see today. Kīlauea Volcano continues to be active. A vent in Halema`uma`u Crater is erupting elevated amounts of sulfur dioxide gas and very small amounts of ash. Resulting high concentrations of sulfur dioxide in downwind air have closed the south part of Kīlauea caldera and produced occasional air-quality alerts in more distant areas, such as Pahala and communities adjacent to Hawai`i Volcanoes National Park, during kona wind periods. The have been several small ash-emission events from the vent, lasting only minutes, in the last week. Lava continues to erupt from the Thanksgiving Eve Breakout (TEB) vent and flows toward the ocean through a well-established lava tube. Lava breakouts in the Royal Gardens subdivision have been active throughout the past week, sending small flows several hundred yards southward onto the coastal plain. Activity at the Waikupanaha ocean entry has fluctuated over the past week. A deflation-inflation (DI) event at the summit led to a brief reduction in activity at the ocean entry on Monday, November 3. A partial collapse of the Waikupanaha lava delta occurred in the middle of last week. No earthquakes beneath Hawai`i Island were reported felt within the past week. Visit our Web site for daily Kīlauea eruption updates, a summary of volcanic events over the past year, and nearly real-time Hawai`i earthquake information. Kilauea daily update summaries are also available by phone at (808) 967-8862. Questions can be emailed to askHVO@usgs.gov. More information on visiting Hawaii in general and touring Hawaii Volcanoes National Park can be found at www.tourguidehawaii.com and www.tourguidehawaii.blogspot.com.